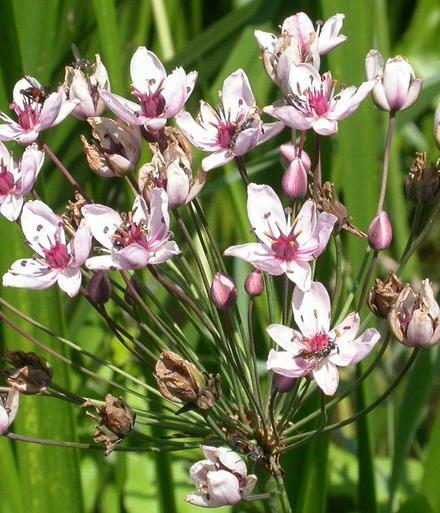 General Description: Flowering rush is an emergent, aquatic, perennial that grows in a range of fresh water habitats. Flower Description: Plants have a cylindrical stalk, up to 5 ft tall, ending in a flat-topped flower cluster with individual flower stalks originating from a common point of 20 to 50 light pink flowers. Flowers have three sepals, three petals, nine stamens and pink pistils. Leaf Description: It has a rhizome that produces thin, upright leaves that may be twisted in growth and reach 3 feet or more in length. They can be emergent, submersed or floating. Leaf bases are triangular in cross-section. Fruit/Seed Description: The seeds are very small and are in follicles. It is an invasive aquatic plant in the northeast U.S. and has a limited distribution Washington. It is an aggressive colonizer and can spread by seed, bulbils and rhizome fragments. It can be difficult to control and research continues on control options.